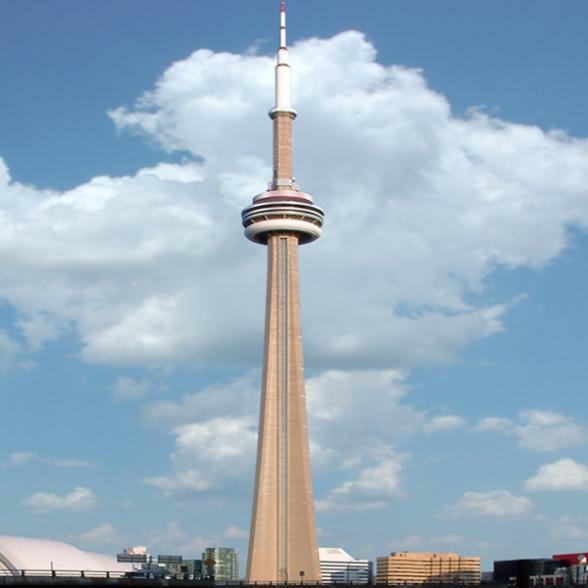 The CN Tower is a communications and observation tower standing 1,815.4 ft tall. It surpassed the height of the Ostankino Tower while still under construction in 1975, becoming the tallest free-standing structure on land in the world. On September 12, 2007, after holding the record for 31 years, the CN Tower was surpassed in height by the still-under-construction Burj Dubai. It remains the tallest free-standing structure in the Americas and the signature icon of Toronto's skyline. It takes only 58 seconds to reach the LookOut level in a glass-fronted lift which travels at 15 miles per hour! Once there, visitors can enjoy a meal at the revolving 360 Restaurant, walk across a glass floor on the 113th storey or get an even better view from the Sky Pod another 34 storeys high. There is also a collection of entertainment attractions at the base of the tower, including two motion simulator rides, and a short documentary film describing the feat of engineering undertaken to build this colossal structure.